I couldn't miss this nifty extension in my series of posts about Firebug extensions. It's a small plugin focused on one thing and working great! This extension is compatible with Firebug 1.12 (will be released in couple of weeks). 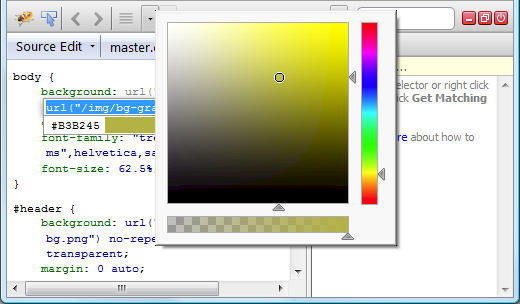 FirePicker adds a small color picker dialog when editing a CSS rule in Firebug. The addon scans for values that can be parsed as CSS colors and displays them in a drop-down list right below the firebug's CSS editor box. Clicking on the color value in the drop-down brings up a color picker dialog. Another Firebug extension we have tested with upcoming Firebug 1.12 (will be available in several weeks) allows managing web storage directly in your Firebug. FireStorage Plus! appends an extra Firebug tab which lets you inspect and modify the local and session storage. FireQuery is one of my favorite extensions for Firebug and I am regularly using it every time I am debugging web application that is build on top of jQuery. FireQuery is a Firebug extension for jQuery development. 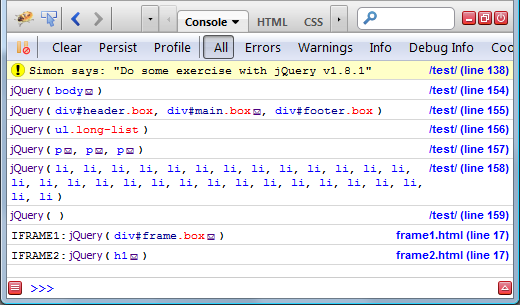 It's a collection of Firebug enhancements for jQuery. How to properly filter DOM event logs? One of the new features introduced in Firebug 1.12 alpha 5 is a filter for DOM event logs (issue 229). Logging of DOM events has been available in Firebug for a long time and the filter should make it more useful and effective in daily usage. The problem is that we are unsure whether UI/UX of the filter is implemented properly. So, if you are using this handy feature please read further and let us know what you think (leave a comment below). I had an opportunity to be a reviewer of a new book about Firebug written by Chandan Luthra. This is actually the second book dedicated to Firebug and so, you might also be interested in the first one. Monitor, edit, and debug any web page in real time with this handy practical guide.